Rembrandt van Rijn (Dutch, 1606–1669). 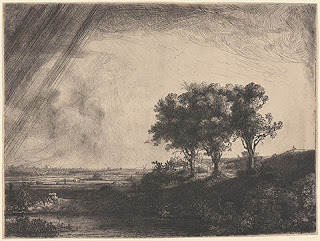 The Three Trees, 1643. Etching, drypoint, and engraving on laid paper. Only state. Plate: 212 x 280 mm. Sheet: 223 x 284 mm. DAC accession number 1951.D1.1. Gift of George W. Davison (B.A. Wesleyan 1892), 1951. Does a museum have to be large to offer open content? The Davison Art Center at Wesleyan University holds some 25,000 works on paper and has three museum staff (2.5 FTE). The collection serves teaching, study, research, exhibition, and other educational purposes. In 2012, we launched the DAC Open Access Images policy. DAC Open Access Images to date represent 3,800 objects, chiefly European prints from the 16th through 19th centuries. They can be found and downloaded via DAC Collection Search. Many are from photography enabled in part by a three-year grant from the U.S. Institute of Museum and Library Services. With a team of six working for six weeks each year, so far two summers of IMLS-funded digitization have yielded images of more than 3,200 artworks. More than 2,500 are free of copyright and online—or very soon to be—as DAC Open Access Images. The factors below are among those central to moving any museum toward open images, and most have implications specific to small museums. Service to Mission: The need to know whether and how providing open images will serve your mission. Determining this is fundamental to deciding what to do and to making the case for resources, regardless of scale. If your mission includes education, this connection can be obvious. Suitable Objects: Collection objects in the public domain or otherwise free of outside intellectual property rights. Individual rights determinations can be time-intensive, especially as a portion of a small staff’s time; but in many small (or large) museums, whole swaths of earlier holdings may be quickly determined to be in the public domain. Internal Leadership: One or more staff members motivated to make open content happen in a sustainable way. In our small museum, that began with one person convinced of its value to our mission, to people who use our images, and to online ecosystems of cultural resources, plus the value of showing that small museums can help move the field forward. This led to crafting a strategy and advocating for it with senior management, who enthusiastically supported the work with institutional resources. Open Policy: A policy stating which images will be made open (to enable selection) and promising that any use is fine (to assure image users). Some small museums can develop and enact such a policy quickly, with more streamlined approvals than in some large museums. Suitable Images: Accurate digital images of objects free of copyright, and/or the ability to make them. This can start small. We had only several hundred when we launched DAC Open Access Images. As a museum with no permanent digitization funding or space, we then moved to a summer of rapid imaging with one-time university resources, and then strategically invoked that successful work for credibility when applying for external funding. Thanks to the IMLS, soon a majority of DAC Open Access Images will have been made with their support. Sustainable Delivery: Infrastructure for reliable public access to images. At small museums, this is best outsourced to avoid unsustainable dependence on keeping in-house hardware online. In effect, we outsource this across campus to our parent university's data center, which includes virtual servers, network, etc. We leverage those general IT resources with an image-delivery technical design that lives on top of them, and we manage it remotely; at other museums, those hosted services might be cloud services, or content might be offered only via consortia, aggregators, or other partners. These selected factors show that institutional scale can be a key factor in how to move toward open content, with small museums sometimes being more agile on the policy side, more challenged to be creative in strategies for growing their digitization resources, and more strongly advised to outsource delivery infrastructure; but scale need not determine whether to choose this path at all. Large museum? Small museum? Sharing open content may be possible either way. My focus = value, impact & strategy of digital. Video of my Keynote - If We Share, Do They Care? African Manuscripts - a treasure in danger? Do you understand your Digital Ecosystem? UK Government promotes Open Data - a public good but where is the money? © Simon Tanner. Theme images by Dizzo. Powered by Blogger.